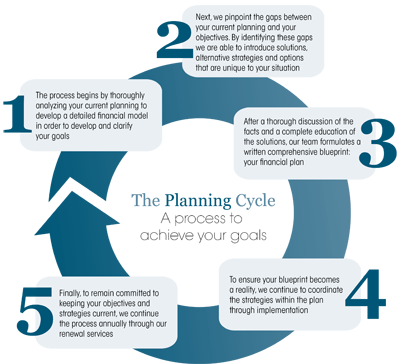 Should we mutually agree to proceed, the next steps entails gathering financial information that we use to analyze your current situation and to identify gaps. Once we have a firm understanding of where you are today versus where you would like to be, we can recommend a suitable course of action. We deliver your plan. You have a choice to implement with us or any other provider. Our hope is that based on your experience to date, you will engage our services. We will implement products and solutions based on your needs. We will stay in contact with you over the course of the year, monitor your progress and make recommendations and tweaks as necessary to ensure you stay on track.